The Kärcher B 60/10 eco! is in a unique category of cleaning equipment designed to fill the need between a mop and bucket and an auto scrubber. This machine cleans 5 times more effectively than a mop and bucket and is less expensive than an auto scrubber. In addition, where auto scrubbers are in use, the Auto Mop can fill a need for effective and safe cleaning between regular scrubbing. 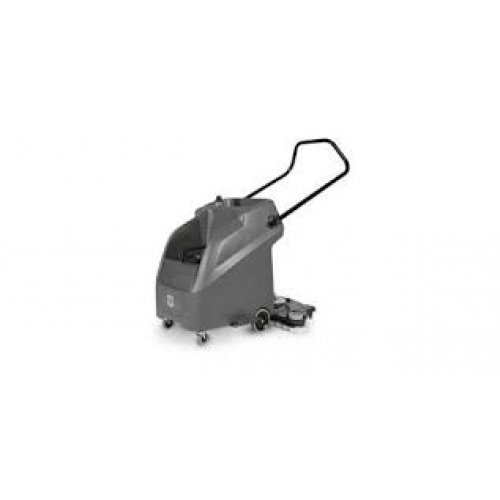 The B 60/10 operates by dispensing clean solution on the floor and picking it up via a manually-powered pump. No power source is needed, making this an easy and green cleaning solution to cleaning floors.